Use the possibilities of KNX for your entertainment as well: Hifi and TV entertainment devices and Internet are connected with your intelligent household technology. In the future, operate your multimedia components simply in a system together with lighting, shutters and temperature. It doesn’t get any more convenient! Rooms become musical! 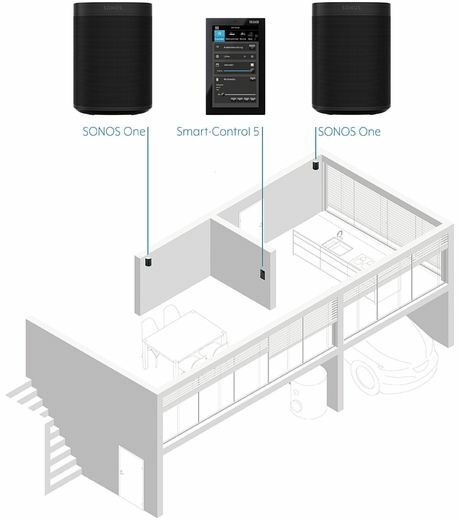 With multirooming in the KNX system you can listen to radio in the kitchen, a classical concert in the living room and an audio book in the nursery, however you like. Whether controlled centrally or with a room control unit: you can individual specify title and volume, with your selection being displayed. The complete entertainment range: With the Smart Displays you integrate your multimedia system into your KNX building technology and use the comprehensive range of functions. With the colour touch screens with intuitive graphical user interface, controlling all functions has never been more convenient.